4 Now the word of the LORD came to me saying, 5 "Before I formed you in the womb I knew you, and before you were born I consecrated you; I appointed you a prophet to the nations." 6 Then I said, "Ah, Lord GOD! Truly I do not know how to speak, for I am only a boy." 7 But the LORD said to me, "Do not say, 'I am only a boy'; for you shall go to all to whom I send you, and you shall speak whatever I command you, 8 Do not be afraid of them, for I am with you to deliver you, says the LORD." 9 Then the LORD put out his hand and touched my mouth; and the LORD said to me, "Now I have put my words in your mouth. 10 See, today I appoint you over nations and over kingdoms, to pluck up and to pull down, to destroy and to overthrow, to build and to plant." 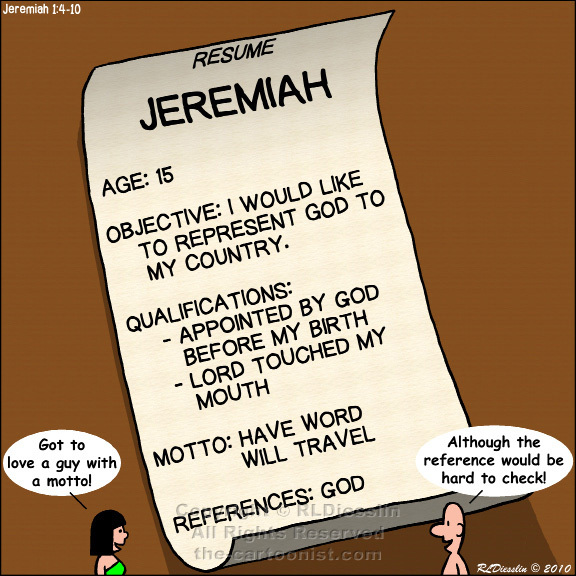 This is Jeremiah's call to be a prophet. It is similar to Moses' calling in that God appoints him, he tries to get out of it, God reassures him that the words he needs will be provided and he finally agrees to it. Unlike Moses though, Jeremiah didn't really have a choice, since he was called in the womb, it was his destiny. Jeremiah isn't just a prophet to Judah but rather to "the nations." To Jeremiah God is at work in all the nations. Even in the calling though, it is clear that Jeremiah is not going to have an easy message - he will be bringing as much bad news as good, but at least the good news comes at the end. Jeremiah is written at about the same times as Isaiah - during the destruction, exile and post-exilic period for the Israelites in Judah.